RazorSQL allows you to query, update, navigate, and manage all major databases from one database tool. With RazorSQL, an SQL query tool, SQL editor, and database navigator, you can run SQL scripts, visually edit, create, alter, and view tables, import and export data, build queries with a query builder tool, and navigate databases with the database navigator. It even comes with a built-in relational database engine that requires no configuration. 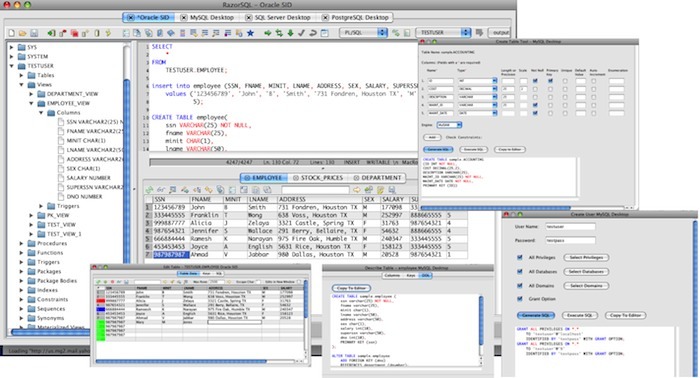 The SQL programming editor has syntax highlighting for SQL, PL/SQL, TransactSQL, SQL PL, and Java, automatic function/method lookup, automatic column lookup, key ahead, built-in and customizable templates, multi-tabular display of query results, query logging, and many other features including a tool to call stored procedures and a tool to compare table and/or query data. RazorSQL has been tested with virtually all popular databases, and includes built in driver support for DB2, Derby, Firebird, FrontBase, HSQLDB, Informix, MySQL, OpenBase, Oracle, PostgreSQL, SimpleDB, SQLite, SQL Azure, SQL Anywhere, SQL Server, Sybase, and Teradata. Next story JPEG4Web 1.8.0 – Process JPEGs for use on the Web. Previous story AirServer 4.6.5 – Stream audio, video and photos via AirPlay. BBEdit 11.1.1 – Powerful text and HTML editor. Navicat Premium 11.0.18 – Combines all Navicat versions in an ultimate version.